Difluorocarboxyfluorescein NHS Ester, 6-isomer (also known as Oregon Green™ 488 Carboxylic Acid, Succinimidyl Ester, 6-isomer) is an amine-reactive fluorinated analog of fluorescein that overcomes some of the key limitations of fluorescein, including greater photostability and a lower pKa (pKa ~ 4.7 versus 6.4 for fluorescein), making its fluorescence essentially pH insensitive in the physiological pH range. Although the mixed isomers of Difluorocarboxyfluorescein NHS Ester, is a preferred, routinely used fluorescent dye for labeling proteins, peptides and nucleotides, purification of peptide and nucleotides labeled with 5(6) isomers might be troublesome due to significant signal broadening in HPLC purification. 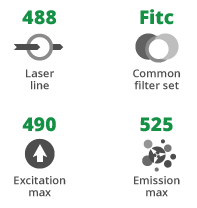 Peptides and nucleotides labeled with a single isomer usually give better resolution in HPLC purification that is often required in the conjugation processes. 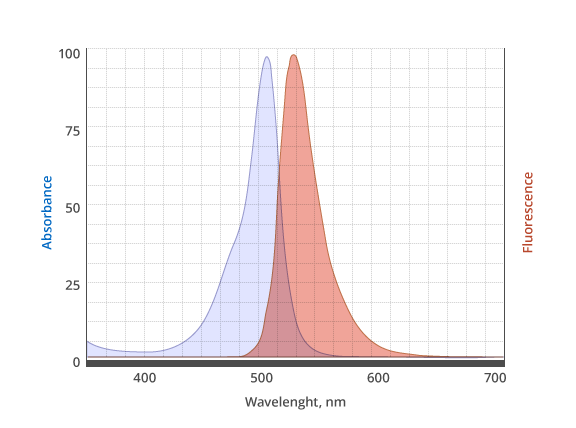 Difluorocarboxyfluorescein NHS Ester dye is structurally identical to Oregon Green™ 488 Carboxylic Acid, Succinimidyl Ester, 6-isomer sold by ThermoFisher Scientific.